The registration limit for the Banquet this year is 450 people. The Association is hosting a free �Meet and Greet� reception at the adjacent high school on the afternoon of the Banquet, June 27 from 4:00 to 5:30 PM. There will be members of the Association Board of Directors present, door prizes, snacks and fellowship. 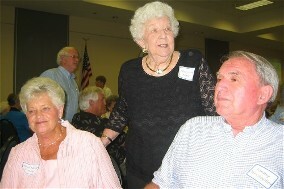 The Oconee County Alumni Association is endeavoring to broaden participation. It includes all Oconee High Schools, now and from the past. It includes all ages or graduating years. Larry Weatherford, who graduated from Watkinsville OCHS in the late 1940’s, has devoted much time and leadership to the effort. The Association has a broad membership on its Board of Directors that reaches over decades of graduates. Since the Consolidated High Schools began hosting in 2007 (Class celebrating 50th), more Bogart graduates are attending. Crowds are maxing out the seating area of the Civic Center.The Association is considering various options to deal with even larger crowds in the future. The registration limit for the Banquet this year is 450 people. The Association is hosting a FREE “Meet and Greet” reception at the adjacent high school on the afternoon of the Banquet, June 27 from 4:00 to 5:30 PM. There will be members of the Association Board of Directors present, door prizes, snacks and fellowship. The Alumni Fellowship Committee chaired by Patti Glass Moody has met several times to plan the event. The committee itself is made up of graduates from the 1940’s, 50’s, 60’s, 70’s and 80’s. The committee recently issued a Press Release about the Reception that appears below. on April 28th at the Oconee County Library "Glass Room"
The OCHS Annual Alumni Banquet, hosted this year by the OCHS Class of l959, is scheduled for Saturday, June 27, 2009, starting at 6:30 PM at the Oconee Civic Center. Attendance will be limited to the first 450 persons who register because of fire codes. In conjunction with the Annual Banquet, the Oconee Alumni Association, which includes all high school graduates, teachers and friends from any Oconee County High School, is hosting the "First Annual Alumni Meet and Greet Reception". The event will be held in the Lobby and Cafeteria area of Oconee County High School (adjacent to the Civic Center) from 4:00 to 5:30 on Saturday, June 27, 2009. The reception is free. Light refreshments will be served and door prizes awarded. Alumni Association representatives will be present to visit with guests. Memorabilia will be on display. Invited are all persons with a connection to any of the Oconee County High Schools: Bogart High School, Watkinsville High School, Rosenwald High School, Ed Stroud High School, North Oconee High School and Oconee County High School. For more information call Patti Glass Moody at (706) 769-7536 or e-mail mulgrove123@aol.com. OCONEE COUNTY HIGH SCHOOLS ALUMNI ASSOCIATION, INC.